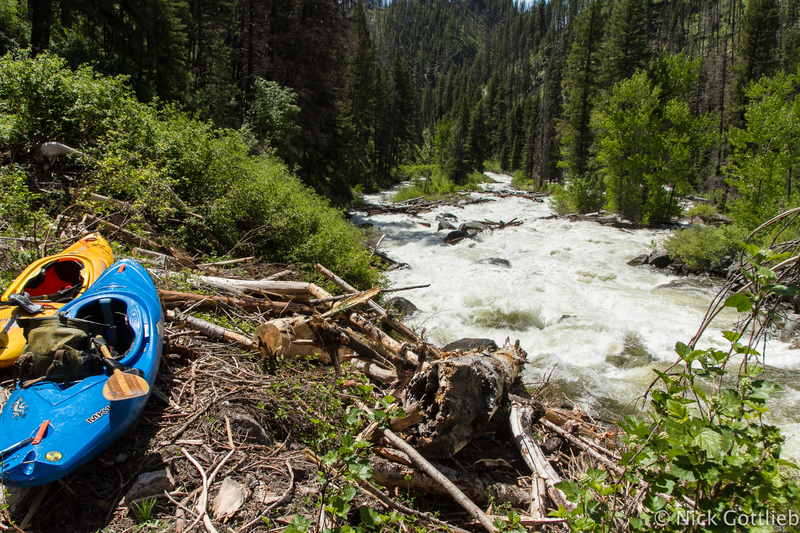 Some classic Salmon River Drainage life-styling at a camp on river-right above Mule Kick. 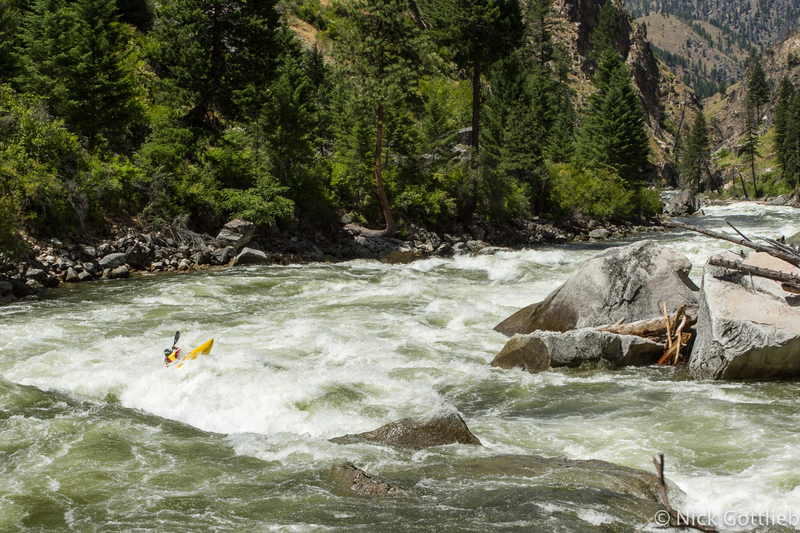 The Salmon River drainage in Idaho is home to some of the most classic multi-day rivers in the country, if not the world. 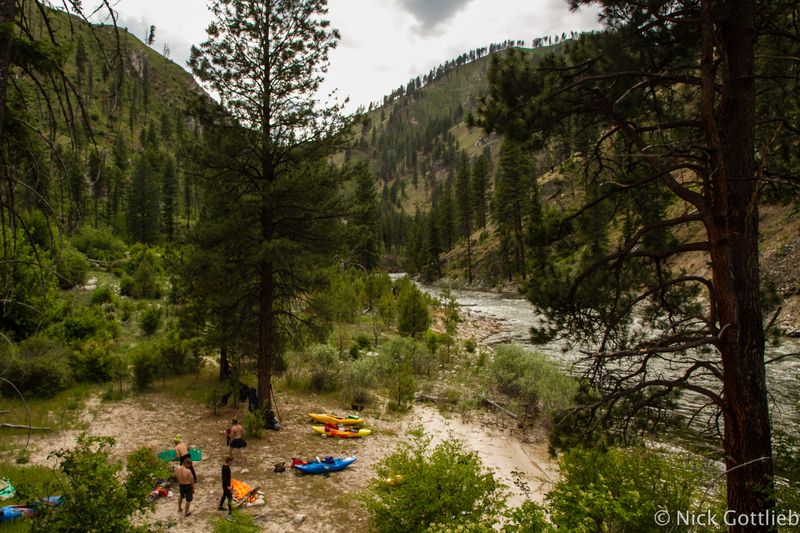 The Middle Fork and the Main are permitted sections of river with phenomenal class III-IV whitewater, beautiful canyons, and hot springs. I’ve kayaked and rafted the Middle Fork a number of times, including a self-support trip at high water this year before permit season started. I try to make a habit of going at least once every year, but I’d never been down the lesser-known South Fork until this summer. The South Fork of the Salmon flows into the Main towards the end of the permitted multi-day run, upstream of Riggins, ID. The South Fork itself is about 35 miles long, with another 20 miles on the Main before you reach a possible takeout (Vinegar Creek). It can be done at nearly any level and ranges in difficulty from pleasant class III at its lowest flows to class V big-water that has been compared to the Stikine at its highest. 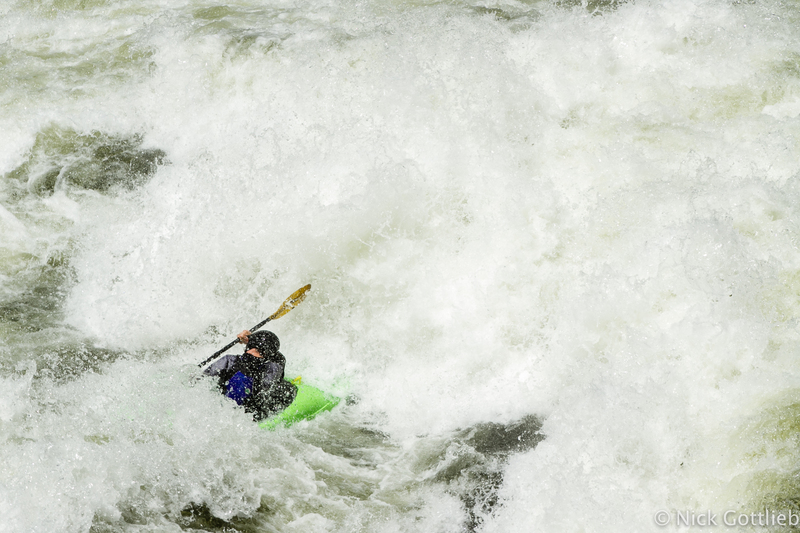 You can only run a rapid blind once…Egor Voskoboynikov paddling through the meat of the second part of Fall Creek Rapid. The one portage on the Secesh — an easy ~1/4 mile walk on an established trail around a massive cascade with every channel blocked by strainers. This “rapid” was actually run by some friends of mine later in the summer unintentionally — thankfully all survived more or less none the worse for wear. I paddled it twice this year, once in June at relatively high water, accessing it via the Secesh River, a 20 mile class IV/V “creek” that would technically be the West Fork of the South Fork of the Salmon River were it not named after a group of secessionists that lived in the area during the Civil War, and again in September at about the lowest flow it got to this year (1.75). Both times were highlights of my year, but the Secesh into the South Fork — and particularly, the South Fork — is, in my opinion, one of the best class IV/V multiday trips anywhere. The Secesh is one of three rivers that join together right near the beginning of the standard multi-day run on the South Fork, the other two being the East Fork of the South Fork and the Goat Creek section of the South Fork. At lower flows, I’ve been told it’s mostly class IV. We had around 49-50” on the stick gauge above the put-in which I think is on the saucy side of medium. The river had a big-water feel and was one of the most continuous sections of whitewater I’ve ever been on — for over 10 miles. With one portage, and only one scout outside that portage, it’s incredible, though the amount of wood makes boat-scouting extremely stressful. When this river is running (typically earlier in the season), it is a great way to access the South Fork, and the road to the put-in is often passable before the road directly to the South Fork put-in. Not to mention the fact that it is possible (with 4×4) to do this 70 mile whitewater trip with a sub-30-mile shuttle. Another group paddles through the crux of Mule Kick — though there’s a lot of rapid above and below, and another major rapid follows shortly after (Elk Creek?). 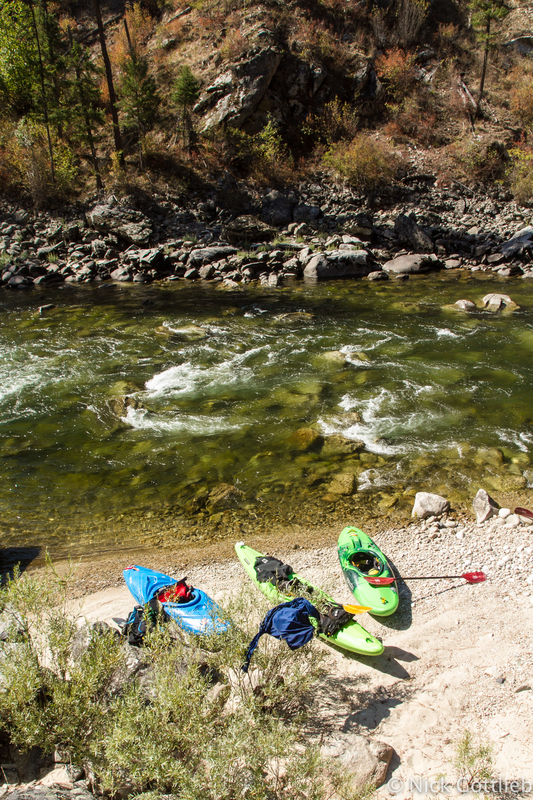 The South Fork itself is the crown jewel of self-support kayaking. It may not be the longest river — easily done in two days — but it features beautiful canyons, great camping, and great whitewater in remote Idaho wilderness. And, to top it off, there’s no permit required (except a free “day-float” permit for the Main Salmon) — you can just drive to the put-in and put on. At our relatively high flows — 5.5-6’ on the Krassel gauge (though that isn’t directly correlated to the flow because it’s above the Secesh confluence) — the river features three big class V rapids and countless IV-IV+ “read and run” big water rapids (some of which arguably push into the V range). Devil’s Creek — the first one — is the easiest, but the most visually intimidating. Mule Kick, a long, complex rapid with a very high scout is easy to get lost in and features a lot of large holes. Fall Creek, the last major rapid before the confluence with the Main, is just about as good as rapids get — a three-part rapid with big moves in each section. On my June run, Russian paddler Egor Voskoboynikov had had enough with scouting and waited in his boat for us to scout Fall Creek, then peeled out and ran it in front of us when we returned. At one point during the trip, he turned to Geoff Calhoun and I and said, “This is good river,” a very accurate assessment of one of the most classic whitewater trips in the lower 48. 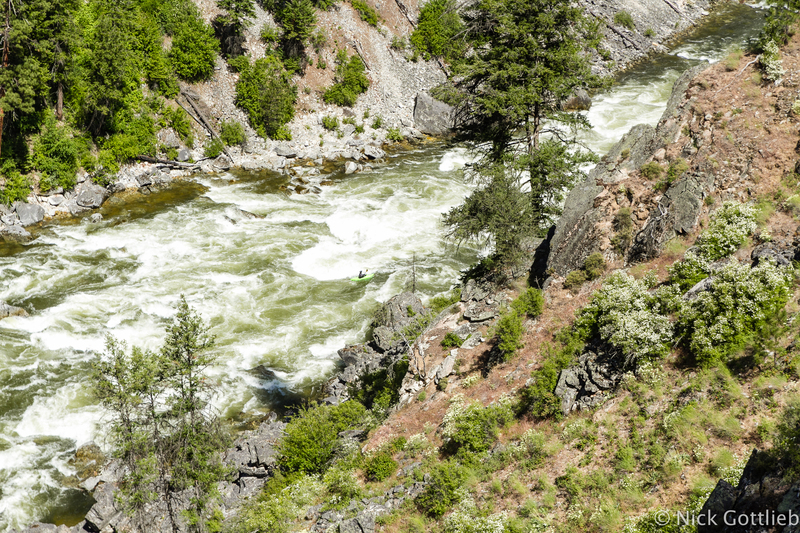 If big water class V is your thing, put the South Fork on your early season list — it’s typically pretty big into June. If not — do it later in the summer. It’s classic year-round, though certainly better with more water. At 1.75 it’s easy III+, but still quite fun — I’m guessing around 3 is optimal for class IV paddlers. I know I’ll be back to the South Fork next year, most likely more than once. Beautiful clear water and sandy beaches — hard to complain about this river even at bare minimum flows in September.